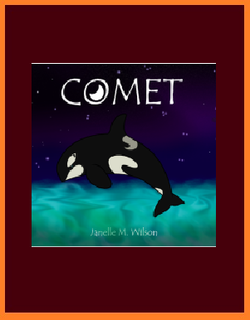 Comet is a story about a young Orca who changes her life through her imagination and the love of her pod family. Janelle M. Wilson was raised in Kane, PA, surrounded by the Allegheny National Forest and spent many days of her early youth exploring nature and wildlife. Her obvious artistic skills are a combination of formal and informal art training. Most of her writing is inspired by her love for wildlife and actual real life events. She graduated with a B.A. in Radiological Sciences in August 2013 and now works as a radiographer. She spends her free time working on writing books and creating various new art projects. The inspiration for Comet came from her deep love, admiration and respect for Orca Whales. This is her first children's book, but not her last!